Summer’s still here and I’m running out of cute, comfy, breezy tops. So, what do I do? Find some more scarves, a thread and needle, and get sewing! This is a more fitted top to show off your summer curves. Get out there and invest in some scarves and you’ll never run out of clothes. 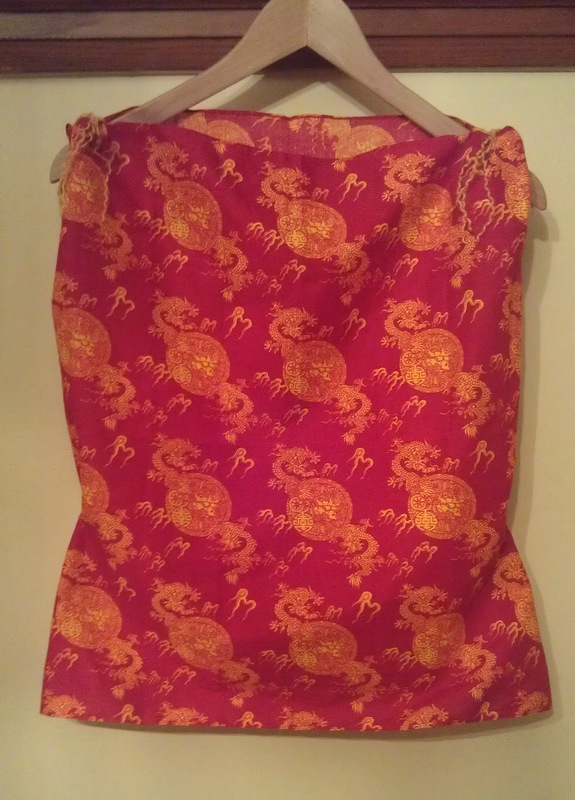 Total Time Required: Measuring, sewing, etc., takes about an hour – especially if you hand sew it, like me. Project Cost: These bandana-size scarves were bought at a dollar store. Just a buck or two each. Thread and wool I already had. first I bought a pair of matching scarves that were bandana size. These next couple of steps are the same as my last scarf shirt tutorial. 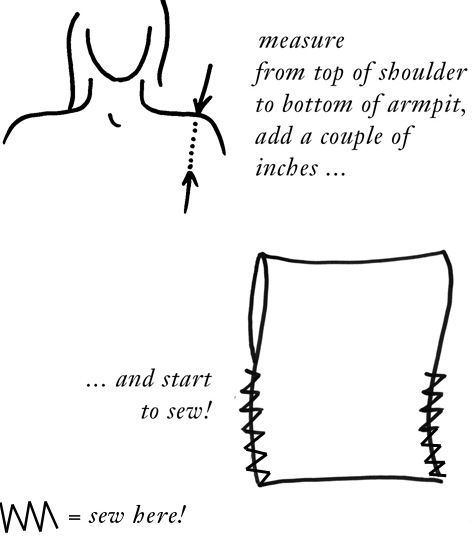 I measured from the top of my shoulder to the inside of my armpit, added another couple of inches for movement allowance, and, putting the scarves front-to-front, pinned and sewed from the bottom of each side to that measured mark. because the scarves are already hemmed, there is no need to hem the bottom of the shirt. I then had to figure out out how wide I wanted the neck to be (I wanted to be able to wear a bra without straps showing, but have a lot of space to get my head through). I measured my head halfway around, making sure it was at LEAST that distance across and then added a few inches for a looser neck. I then sewed the rest of the way across on both sides of the neck hol e.
To give the top a bit of shape, I simply measured up to my waist on both sides, folded the material in at those spots, and sewed the gathered part together, on the wrong side of the material (like a fake dart). to get rid of the boxy, stiff look around the shoulders, I got some complementary wool, tied it around the shoulder area, pulled it tight and tied it. I then sewed a little loop in the middle, around the wool, so it wouldn’t fall off it untied. If I was doing a more complex job, I probably would have threaded the wool through the top of the shoulder and pulled it tight at both ends, but that’s for another project. I unravelled the wool for a crimpy look and that was it. I was done in about an hour and the funk factor in my closet has increased exponentially.